Topics included the cyclical and secular outlook for commodities, the potential diversification and risk-adjusted return benefits of commodities and natural resource equities, and insights from the investment team's recent research trips around the globe. 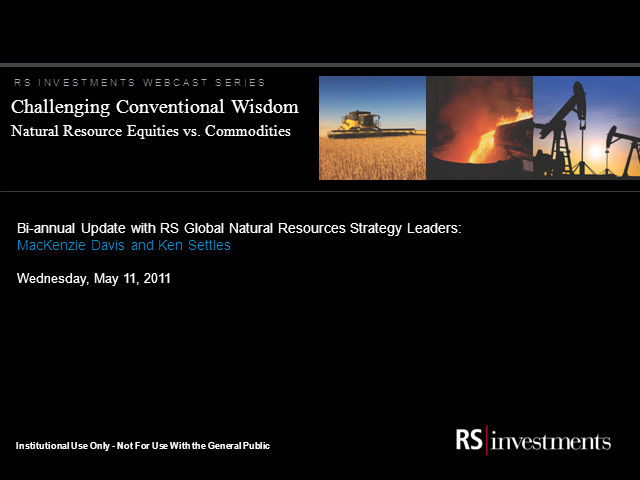 The webcast was co-hosted by MacKenzie Davis and Ken Settles, leaders of the RS Hard Assets Team and managers of RS Global Natural Resources strategies. MacKenzie Davis and Ken Settles who lead the RS Hard Assets Team and manage the Global Natural Resources strategies. James Anderson, co-Portfolio Manager for RS International Growth Fund discusses where his team sees dynamic growth opportunities unfolding around the globe. Members of the RS Hard Assets team discuss RS' approach to extracting value from natural resource equities. Presented by: MacKenzie Davis and Ken Settles who lead the RS Hard Assets Team and manage the Global Natural Resources strategies.